Project categories specify what kind of project you are creating or working on. You must create a project category before creating a project. This is why it is very important to create several project categories. It will allow your users to easily specify project categories while creating new ones. In this documentation, we will learn how to create and manage project categories. You will be taken to the project category creation page. Now, you have to enter the project category name, and description. After providing enough information. Click on the “Add New Project Category” button. The category will be saved and visible of the right panel of the page. Hover over the project you want to edit and click on the ‘Edit' button. Now, you will find the Categories editing page. From here, you can edit the product name and the description. When you are done with editing, click on the ‘Update Category' button. To cancel editing, click on the ‘Cancel' button. You can also delete the category if you want. To delete a category, check a category name and select ‘Delete' option from the drop-down. 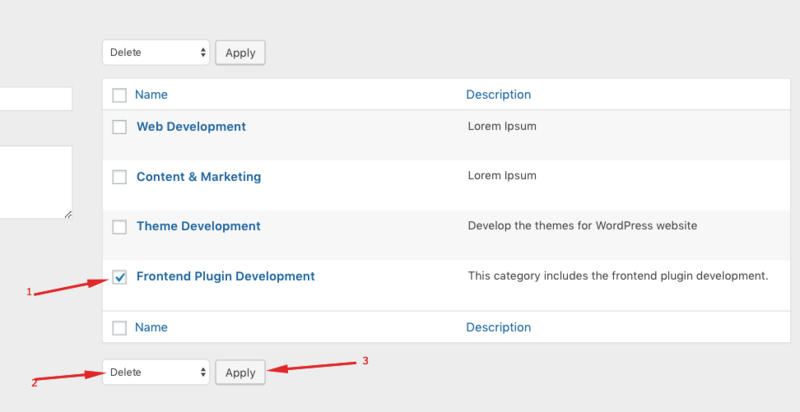 Next, click on the ‘Apply‘ button to delete the category.